For more information on Luxembourg´s capital market, occupancy rates, rent progression and outlook consult the full market report of INOWAI. 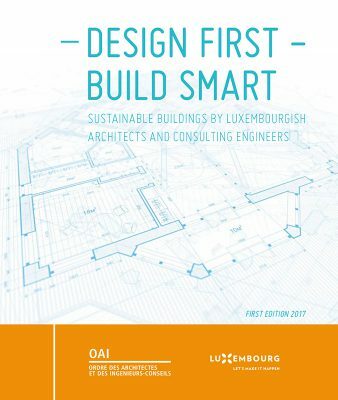 Discover the latest publication of the Luxembourg’s Order of Architects and Consulting Engineers (OAI): Design first – build smart. The brochure is a visual summary of excellence in Luxembourg architectural and engineering design at home and in other countries. The selected works for this publication were chosen either because they demonstrate a Luxembourg architectural project realised in a foreign country or/and were awarded at least one, if not multiple, environmental certifications. This new book thematically showcases the talent of our growing number of architects within Luxembourg’s Order of Architects and Consulting Engineers (OAI), an important pillar of our country. This is a very dynamic and growing sector. In 25 years, the number of architect offices has almost tripled (613 in 2018) and the number of consulting engineer offices has almost quadrupled (227 in 2018). These offices employ more than 4,478 people in Luxembourg. On an economic, social, artistic and cultural level, the OAI’s mission is to help people to attain sustainable, smart and high-quality living and working environments. (…) This book celebrates the tangible results of a design philosophy that considers the end of life of everything that goes into a building and potential impacts into the future.